The No. 2 Boston University men’s hockey team was unable to overcome a two-goal deficit to secure a win against Minnesota State University on Saturday night. The Mavericks (2-1) completed their weekend sweep over the Terriers (2-2) with a 3-0 win. Saturday night started off similar to the Friday night — filled with many penalties from Minnesota State and the Terriers outshooting their opponent. BU had three power play opportunities within in the first 12 minutes of the game, but were unable to capitalize despite putting up a collective five shots on those chances. The Terriers also outshot the Mavericks 12-5 in the first period, but that number significantly dropped to in the second period and the Terriers were outshot 14 to four. Minnesota State ended the game only outshooting BU by 28-26. Minnesota State head coach Mike Hastings said his team’s junior goaltender Jason Pawloski is what kept his team in the contest. Minnesota State came out with a fast and physical game once again, but BU was able to keep pace and its defense did not let up any goals. Neither team was able to get through either goaltender and went into the first intermission with the scoreline at 0-0. Despite scoring the first goal of the night on Friday, the Terriers were unable to survive their third penalty kill in the second period due to a penalty for too many men on the ice. Mavericks defenseman Ian Scheid got a shot off on the left face-off circle and forward Nick Rivera was able to poke the puck into the goal at 7:15. 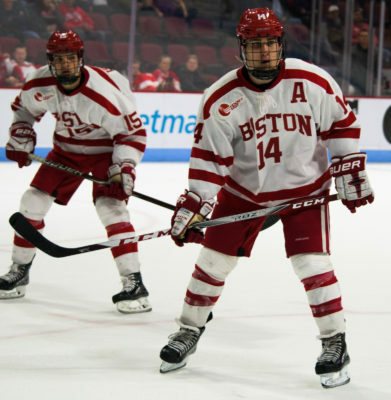 BU’s captain and senior defensemen Brandon Hickey said he liked his team’s physical response compared to the first game of the series, but that his team needs to focus on making simple plays. Minnesota State got another chance when senior defenseman Clint Lewis got the puck through traffic. However, the goal was nullified due to goalie interference and the score stayed at 1-0. The Terriers were unable to capitalize on the null goal and the Mavericks did so instead. Forward Marc Michaealis got a feed to senior forward Zeb Knutson who shot it towards BU sophomore goaltender Jake Oettinger who blocked it, but senior forward C.J. Suess was able to get past freshman forward Ty Amonte to get the goal through to the open net. Going into the final frame, the Terriers were unable to come back and could not convert on its lone power play opportunity in the beginning of the third period. BU ended up going zero-for-four on its power play and Quinn said he’d like to see his team get more shots. Minnesota State’s Michaelis got an empty-net goal to seal the Mavericks’ 3-0 win over the Terriers at home.